[S1145] Descendants of Nathan Smith of North Carolina [http://lewis187.home.mchsi.com/Wilkinson/Smith-98.htm#a], Charles E. Lewis, Davenport, IA, lewis184@mchsi.com. Nathan Smith was born in about 1725 in North Carolina. In about 1750 in North Carolina, Nathan married Ann Smith b. c. 1733. By 1751 Nathan and Ann settled in Bladen Co NC and began raising their family. The first documentation for this family is from the 1768 Cumberland Co NC patent for land on Richland Creek near what is now Putnam NC. In 1784 Moore County split from Cumberland County. A Nathan Smith is found in the 1790 Moore Co NC Census. With him is one female of indeterminate age. Did Ann die before 1790, and is this daughter Mary living at home? Nathan Smith, et. al., migrated in about 1795 from North Carolina to an area thought to be Franklin Co GA. 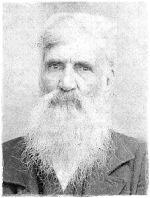 The Cherokees complained that the Nathan Smith Settlement was on their land. Benjamin Hawkins, an Indian Agent, was sent to Georgia to determine who was right, the settlers or the Indians; and, he decided in favor of the Indians. Note, the Nathan Smith Settlement was probably located in the vicinity of Holllingsworth, Franklin (now Banks) Co GA near where Fort Hollingsworth still stands. Evidence for locating the Nathan Smith Settlement at Ft. Hollingsworth comes from a deed showing James Minyard, Resident #42 on the list, owning property on Mountain Creek. This property is located approximately 1/4 mile south of Hollingsworth GA. The land dispute went on for many years, and the settlers became discouraged. On 9/13/1798, members of the Nathan Smith Settlement sent a petition to the Governor of Georgia, requesting some sort of relief. With the "Four Mile Purchase" of 1804, the boundary of the Cherokee Purchase was extended north and west, and these lands were added to then Franklin Co GA. Although the newly purchased lands included a majority of settlers in the previously disputed territory, many settlers of the Nathan Smith Settlement were either out of luck or had already moved on. As some awaited final resolution, other members of the settlement sold their lands "warranted against all but the Indian Claims," continuing their southern and western migration. Four of Nathan Smith's sons and many of their neighbors migrated by 1813 to what would become the Fair River, Bahala, Bogue Chitto, and McCall Creek settlements of Lawrence and Franklin Counties in Mississippi. Nathan and his wife are believed to have lived the remainder of the lives at the original settlement, and are buried somewhere in what is now Banks Co GA.
11 Oct., 1749. Nathan Smith.250 acres in Craven Co. on S. side of Neuse River and on S. side on S. W. Creek, joining the creek and George Roberts on a Beaver Dam. JOHN McLOUD: 4 Dec. 1772 LEVY PENNINGTON planter, & wife, MARTHA (X), to JOHN McLOUD, farmer, all of Cumberland, for £50 N.C., 200 a. on Richland Creek incl. The plantation whereon sd. PENNINGTON now lives, adj. CAMPBELL's upper line, patent to NATHAN SMITH 22 Dec. 1768. Wit: JAMES MUSE, JOHN MARTIN. Proved by JOHN MARTIN Jan 1773. 20 Jul 1771 NATHAN SMITH, and ANN SMITH his wife, planter of Cumberland Co. to Levi Pennington, Sr of Cumberland Co., 45pds, land in Cumberland co. on Richland Creek branch of McClendon's Creek. s/ NATHAN SMITH, ANN SMITH w/ John Stephens, Isaac Pennington. 30 Jan 1772. Deed: NATHAN SMITH & wife ANN to Levi Pennington, Sr. proved by John Stephens. 25 Oct 1774. Deed: Jesse Ritter to NATHAN SMITH proved by William Manes. Joseph Neale and wife Frances to Elbert Co GA to Nathan Smith of Franklin Co. In cons. of $900, conveys 600 acres in Franklin Co on Hudson Fork of Broad Riv., adj. Kulian Neale, Thomas Gregg, being two tracts granted to Julian Neals 17 Mar., 1786, and registered in Book III folio 610.612.. Signed: Joseph Neal, Frances Neal. Wit: Benjamin Neal, H. McDonald JP. Dtd 18 Feb, 1803. Rec Oct. 5, 1803. Thomas Gregg and wife Anna of Elbert Co GA to Nathan Smith. In cons. of $100, conveys 262 ac. in Franklin Co on Hudson Riv., adj. Nail, Gregg, and Stephen Smith. Warranted against all but the Indian claim. 18 April 1804, rec. 7 June 1808. From Lewis Dickerson (x) of Franklin Co. to Isham Smith of same. In consideration of $1,065, conveys 200 acres in Franklin County on Hudson Fork of Broad River, granted to Joseph Martin Russell, and by him conveyed to Thomas Warren, who conveyed it to John Parker, and conveyed by Parker to said Dickerson, adj. Hableton. Wit: John Douglas (x), Caleb Griffith. Sworn to Douglas before Jno. Collins, J. P. 21 May 1808. 3 Oct., 1806. James Blair to Christopher Kelly. In cons. $250, conveys 155 ac. in Franklin Co. on Wards Crk., waters of Tugalo Riv., being part of land granted to Samuel Ward 24 Sept., 1803 by Gov. John Milledge as surveyed by George Henning, Dep. Sur. 6 Feb., 1792, adj. land surveyed for William Hay. Wit: W'm Smith, James Sparks, Benja. Cleveland, Joel Yowel JP. [S1143] Gone to Georgia [http://lewis187.home.mchsi.com/History/GTG.htm], Charles E. Lewis, lewis184@mchsi.com. Nathan Smith was born in about 1725 in North Carolina. By 1751 Nathan settled in Bladen (now Moore) Co NC where he began raising his family. Nathan Smith, et. al., migrated in about 1795 from North Carolina to an area thought to be Franklin Co GA. The Cherokees complained that the Nathan Smith Settlement was on their land. Benjamin Hawkins, an Indian Agent, was sent to Georgia to determine who was right, the settlers or the Indians; and, he decided in favor of the Indians. "The first settlers of what is now Habersham County were those settlers of Franklin County, whose lands were granted by the State of Georgia between 1783 and 1788, lay north of the Indian Boundary fixed by the treaty of 1785. These lands were granted under the impression that they lay south of the agreed boundary line. "The First Settlers," Lavonia Times and Gauge, 23 February 1934. Once the original purchase was surveyed, a report was forwarded to the agent at Ft. Southwest Point, delineating the extent of the problem and listing the names of settlers who were found to be beyond the boundary and intruding on Cherokee lands. Summary of a Report of Colo. William Wofford, made to Colo. Return Jonathan Meigs, agent to the Cherokee Indians, Southwest Point, regarding the number and condition of the Settlers living in and near the "Wofford Settlement", on the Frontier of Georgia and the Cherokee Nation of Indians ? lying between the Currahee Mountain and the headwaters of the Oconee River. Capt. John Little's Settlement. Original Smith's group. New Settlers in Smith's settlement. Joshua Darnigan's Settlers. Original settlers Darnigan's group. (T) - Tenant - lives in Georgia. New Settlers - Intruders after line was run - None are connected to Wofford. "1804 Franklin Co., GA," Georgia Genealogist, 1790-1798. The land dispute went on for many years, and the settlers became discouraged. On 9/13/1798, members of the Nathan Smith Settlement sent a petition to the Governor of Georgia, requesting some sort of relief. His Excellence James Jackson, Gov. of Georgia. We are induced from the peculiarity of our situations as Frontier citizens of Jackson & Franklin Counties to address your Excellency and implore your interposition in our favor. - We beg leave to represent that we hold titles derived from Grants issued by the State of Georgia for Lands which have proven to lie beyond the temporary boundary line, lately extended under the Superintendence of Colo. Hawkins, Agent of Indian affairs for the United States; that these lands, which we have honestly paid for, which we have been at great Labour and expence to improve and on which (exposed to savage depredations for Several years) we have hazarded the lives of ourselves and our families, we are now forbidden to occupy. - Thus after exhausting all our resources in the purchase & improvement of Lands, we are now told that we must abandon these homes, destitute (as we are) of the means of providing others for our families. The lands we hold were granted between the years 1783 & 1788 which we need not remark to your excellency was anterior to the Treaty concluded to New York.- We think it proper also to observe that evident inaccuracies have been commited in running of the line from the Currawhee Mountain to the source of the Appalachee, by which that line has been thrown much further in upon the inhabitants than it would have gone if it had been carried direct from one of these points to the other. We pray that your excellency will have the goodness to signify to us by letter addressed to Capt. John Little to the care of Daniel Beall Esq. At Franklin Court House, or in any other way that your Excellency may deem proper and expedient, your opinion. If your excellency has the power of affording us relief we count with great confidence on receiving it. If your Excellency has not that power, we beg that you will represent our situation to the next Ligislature and implore for us that redress which your excellency may think our cases entitled to. Philip Thomas, John Thomas, Wm. Thomas, Philip Thomas Jr., Abednego Downing, Geo. Waters, Levi Taylor, James Huit, Solomon Huitt, Wm. Alexander Tansey, Jesse Austin, Tho. Barnard, Lucas LeCroy, Thomas Lean, Equila McKrakin, James McKrakin, Holcom, Geo. Hopper, Wm. Weatherspoons, Hugh Hartgrove, Nathaniel Wofford, Richard Burkes, Benjamin Wofford, Richard Lay, Nicholas Smith, Nathan Smith, O(w)en Carpenter, James Minnerd, Nicholas Nuton, Stephen Smith, (an illegible signature of the original document), Lewes Dickeson, Joseph Halcom, Jno. Parker, John Ratley, Thomas Warren, Robert Shipley, John Shipley, Nathaniel Shipley, William Little, Joseph Dunnegame, Ande Dunnegane, E. Dunnegame, Moses Terell, Jno. Little. History of Franklin Co. GA, page 107. With the "Four Mile Purchase" of 1804, the boundary of the Cherokee Purchase was extended north to Currahee Mountain and west to what is now Alto, Georgia. And, these lands were added to then Franklin Co GA. Although the newly purchased lands included a majority of settlers in the previously disputed territory, many settlers of the Nathan Smith Settlement were either out of luck or had already moved on. SMITH CREEK, White County, Georgia. Located below Anna Ruby Falls. Named after the former Nathan Smith settlement. Smith Creek, which is formed below Anna Ruby falls was named by a surveyor for an early settler who owned land further south. "Anna Ruby Falls Trails," Georgia Trails, No date <http://georgiatrails.com/trails/annaruby.html> 12/25/2005. This location near Helen GA made sense; as it placed the settlement beyond the limits of the 1804 Four Mile Purchase. This was important because descendants of Nathan Smith sold their property "warranted against all but the Indian Claims," acknowledging that they probably were intruding on Cherokee lands. However, the removal/migration of intruders before 1804 indicates that the actual location of the settlement may have been beyond the 1798 Col. Hawkins Line but still within the later 1804 boundary. After the 1798 survey, Col. William Wofford enumerated the inhabitants of his settlement and others which were proven to be beyond the Hawkins Line, including the inhabitants of the Nathan Smith Settlement. By 1804 this list of inhabitants was updated to show additions to and deletions from the original families and new intruders. Of note, the letter "R" denotes those who removed/migrated from the territory by 1804. Further research shows that #44, the Stephen Smith who migrated to Mississippi, had a letter "R" annotated behind his name, indicating that he migrated from the settlement before 1804. Where was the actual location of the settlement? The 1804 Wofford list for the Nathan Smith Settlement shows a new inhabitant, #63 Jacob Hollingsworth. Reasonable conjecture leads to the belief that the extant Fort Hollingsworth, located at Hollingsworth in Banks Co GA, might be the actual location of the Nathan Smith Settlement. "Some History of Banks County, Georgia," GenWeb Site, 2003 <http://www.rootsweb.com/~gabanks2/htmlpagesbanks/bankshistory.html> 25 December 2005. The following is a History of the Smith Family written by Sharon Smith Logan. Stephen Smith was in all probability the son of Isham Smith who was born about 1760, North Carolina. In the 1790 Census of North Carolina, an Isham Smith appears in Montgomery County and an Everitt (Averitt) Smith appears in Moore County (Moore and Montgomery are adjoining counties), North Carolina. Smiths with the Christian names of Everitt, Stephen, and Isham appear early in Lawrence and Franklin Counties, Mississippi. The Smiths migrated from North Carolina to the Nathan Smith Settlement prior to 1800 to what they thought was Franklin County, Georgia but later was deemed to be Cherokee lands. The Cherokees complained that the Nathan Smith Settlement was on their land. An Indian agent by the name of Benjamin Hawkins from Washington D. C. was sent to Georgia to determine who was right, the settlement or the Indians; he decided in favor of the Indians. The land dispute went on for many years and the settlers became discouraged and sold their lands "warranted against all but the Indian Claims". The Smiths migrated in the early 1800's, to Fair River, Bahala, Bogue Chitto, and McCall creek areas of old Lawrence and Franklin counties, Mississippi. Isham Smith, John Smith, Adam Sheffield, James Keys, Joseph Shelton, Samuel Spencer, William Spencer, Richard Jacks, John Huitt, Jacob Hollingsworth, Moses Alfred, William Smith, Averitt Smith, James Brown, Temple Carpenter, John Warren, James Hamilton, Nimrod House, James Alfred, Thomas Bullen, William Newton, ____ Snow, Asa Walker, Morgan Guest, George Morgan, Reuben Warren". Of the above names found in Nathan Smith's Settlement, the following relocated to Mississippi: Nathan Smith - Franklin County, Nicholas Smith - Franklin County, Owen Carpenter, Lawrence County, Isham Smith - Lawrence County, Asa Walker - Lawrence County, Temple Carpenter - Lawrence County, William Newton - Lawrence County, Morgan Guest - Lawrence County, and Averitt/Everitt Smith - Lawrence County. It appears from the above transcripts that the Smith land was reclaimed by the Cherokee Nation and that the Smiths then migrated to Lawrence Mississippi prior to 1813. In the 1813 Tax Roll of Marion County (note: Lawrence County was formed from Marion in 1814), Isham Smith, Sr. is shown with a lot in Monticello with no poll taken. Persons exempt from poll taxes were over 50 years of age, thus the estimate that Isham Smith, Sr. was born about 1760.